Learn new skills and make something happen! 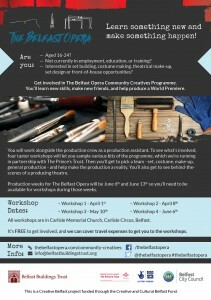 We’re hugely excited to launch The Belfast Opera Community Creatives programme. It’s now open for people to sign up at here. 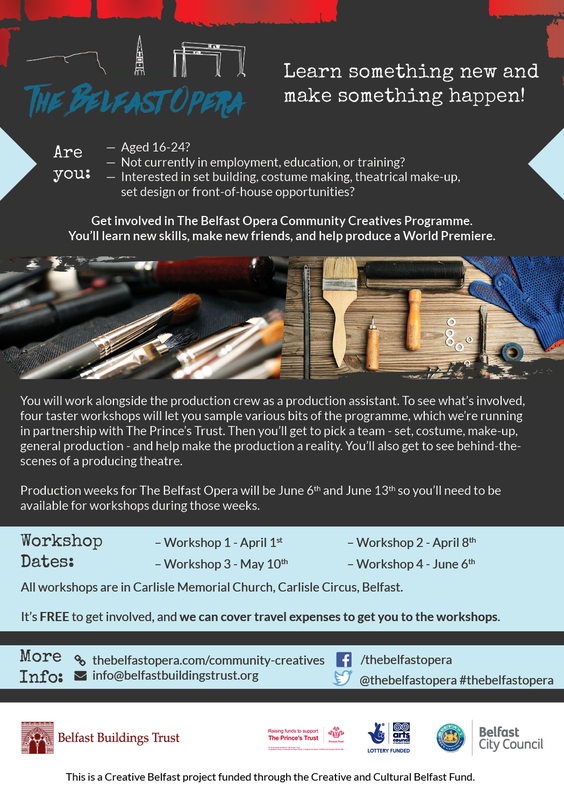 Our Community Creatives team will be central to making the World Premiere of The Belfast Opera actually happen. The 50 young people will work as production assistants alongside the crew to build the set, make the costumes, plot lights, design make-up for the performances, and even occupy front-of-house positions for the three premiere performances in June. It is at the heart of the community regeneration ethos of what The Belfast Opera is all about. The programme will be run in partnership with The Prince’s Trust. It is aimed at young people aged 16-24 who are not currently in employment, education, or training, but is open to anyone who wants to take part. To complete your registration for the Community Creatives programme, go to this link and fill in our short 4 question survey. P.S. We’ve changed the venue for the workshop on Friday 8th April. It will now take place in the old St. Patrick’s School, 193-195 Donegall Street, starting at 10am.